What Happens When Windy City Culture Mingles with the Sun Belt’s Hot Breeze? This much has always been true: When you’re a kid, the experience of moving to a different city and leaving behind friends and familiar places can feel like something approaching death. But in the 21st century, there’s a new twist: It’s easier to take your old hometown with you. I didn’t know that when I was 11 years old, and my world was rocked by a series of events. My parents got divorced. My mom decided to get remarried. And to accommodate my soon-to-be stepdad and his stable, pre-Great Recession job, my mom, my two younger sisters, and I left my hometown of Chicago and moved to Phoenix, Arizona. Those two places are more than 1,700 miles apart. But I would discover that at this moment in U.S. history, two big American cities, both full of lots of people from someplace else, can feel like neighbors—no matter the distance between them. And so, nine years after arriving in Phoenix, I still identify as a Chicagoan. It’s not just because that’s where I was born—it’s because Phoenix has reinforced that identity. I arrived, of course, kicking and screaming. Before I moved here, my preconceived notions of Phoenix were similar to what I had seen in old Western movies that I watched with my grandfather—a barren wasteland of desert, filled with nothing more than tumbleweeds blowing in the hot wind and shootouts between John Wayne-esque cowboys. I can still feel the uncomfortably hot breeze on my face as I stepped off the plane in July of 2007. (For the lucky ones who are unfamiliar, a Phoenix breeze in July feels like the strong whisper of a hot breath in your ear—only one that encompasses your entire body.) It was nearly exactly how I had pictured it, only instead of cowboys there were middle-class, white Americans who felt the need to open-carry into the local Walmart. Because, Arizona. At first, I didn’t care much for the desert urban reality. I hated it. I despised it. I loathed it. Phoenix is a difficult city to relate to. “How can you relate to a city?,” I know you’re thinking. Take one stroll through Chicago and you’ll understand. The city is full of life, echoing with the sounds of street performers and rumbling under the rush of the Loop train. Chicago is one of the biggest cities in the nation, but everyone seems to know one another. It’s a major city that feels like a small town. Phoenix … is rich in expats like myself. Many people moved here from someplace else, so all kinds of midwestern transplants like me were looking for new friends and communities where they belonged. I missed it. But the more time I spent in Phoenix, the more I realized that Chicago’s roots extended well outside the Windy City. 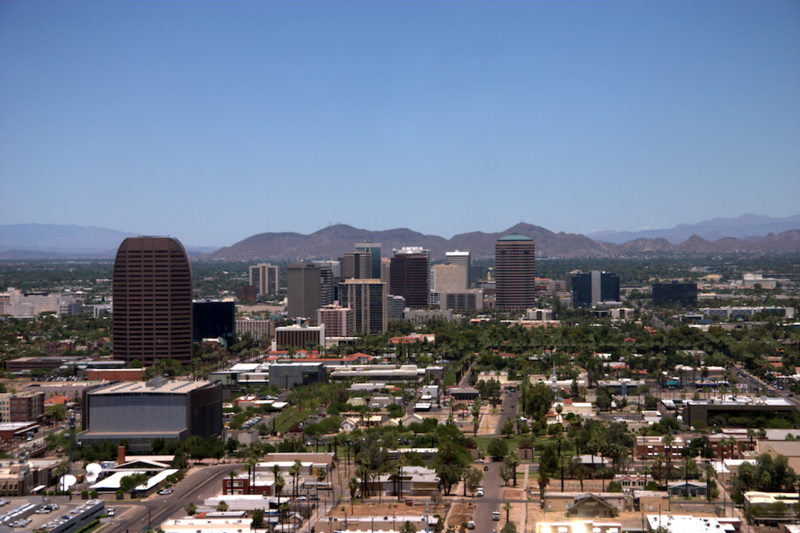 Phoenix was—and is—rich in expats like myself. Many people moved here from someplace else, so all kinds of midwestern transplants like me were looking for new friends and communities where they belonged. I was especially lucky that many Phoenicians are originally from Chicago, and came here to escape the cold, find more affordable living, or find work. My family and I slowly connected with other Chicagoans, both in person and online. Some of our neighbors turned out to be from Chicago as well, creating a familiar feel within our neighborhood. My family joined Facebook forums focused on uniting Chicagoans in Phoenix and we used the sports cultures to keep connected. We watched or attended Chicago Cubs vs. Arizona Diamondbacks games, Chicago Bears vs. Arizona Cardinals games, and, ahem, Stanley Cup Champions Chicago Blackhawks vs. Arizona Coyotes games. After I began my freshman year at Arizona State University, the connection between the city that I loved and the city that I was thrust into only grew stronger. I ran into more and more students or faculty who were from Chicago, coming for the academics (or the parties) and bringing their Windy City pride with them. I was no longer a lone outsider struggling to find an identity in this new home. My identity as a Phoenix resident was molded by my love and pride for my old home, one that I could share with other, like-minded Chicagoans around me. Throughout the nine years I’ve lived in the Valley, I watched the Windy City get blown across state lines. The market of Chicago-themed sports bars boomed. The Chicago Cubs established a brand-new spring training stadium in Mesa. Often, more Chicago sports fans showed up to Arizona games than home team fans. Wearing your team’s jersey or gear would inevitably get you a, “Hey, go Cubs!” or “Da Bears!” as you walked down the street. Classic Chicago food joints such as Portillo’s began popping up all over the place. Chicago wasn’t just housed within the confines of Chicago anymore. Slowly but surely, Chicago subsumed itself into Phoenix, giving the city an entirely new identity. While Phoenix still isn’t, and never could be, as beloved to me as Chicago, I’ve grown to accept and rejoice in the merging of my two cities. I can take a shuttle to Sloan Park and sing along to “Go, Cubs, Go” as the Cubs take on the Los Angeles Angels. I can go down to Lou Malnati’s and grab a classic, deep-dish pizza. I can impress my friends and total strangers with an occasional slip into my accent. I can fend off jokes about being too cold in 60-degree weather. You can take the girl out of Chicago, but you can never take Chicago out of the girl—thanks to the welcoming arms of a Sun Belt city like Phoenix. Jessica Suerth is a Sustainability Fellow at Zócalo Public Square. She is also a student studying journalism at the Walter Cronkite School of Journalism and Mass Communication at Arizona State University. *Photo courtesy of Sean Horan/Flickr.